Benny Hinn is Extremely Deceptive! Benny Hinn teaches that there are NINE members to the Godhead. Hinn is very deceptive. If you look at Benny Hinn’s website, you might be totally convinced that he’s a born again Christian. Yet, Hinn’s life contradicts his statements. If a famous preacher claimed to believe in freedom and America; but then you find out that he was a member of the Communist Party at the SAME time, what would you think? That man is Martin Luther King Jr. Would you believe his words about freedom? No! Likewise, Benny Hinn presents the Gospel on his website; but, then praises the Pope, recognizes Our Lady of Fatima (Mary) as legitimate, partakes of transubstantiation (Catholic holy communion), and promotes Catholicism–The biggest cult on earth! And by the way, Hinn never actually states in his online Gospel presentation that a person doesn’t have to doworks to be saved. And also, every Catholic believes the simple Gospel, i.e., that Jesus Christ died, was buried, and rose again for our justification. The church of Galatia in the Bible fell victim to the same type of heresy. They had heard the simple Gospel; but, now were being led to follow a works salvation by a false religion, “I marvel that ye are so soon removed from him that called you into the grace of Christ unto another gospel” (Galatians 1:6). Benny Hinn fools multitudes of people by presenting the Biblical Gospel on his website; BUT, then promoting the damnable heresies and idols of Catholicism. To promote Fatima (see below) is to promote the Catholic Virgin Mary. There are many hidden heresies which Hinn’s website doesn’t mention. There is a great evil in the religious world today, and it is very subtle. The evil is that of preaching a TROJAN HORSE Gospel. After ten years of trying to conquer the people of Troy, the Greeks devised a sneaky plan. They left a giant horse, as a gift, outside the city gates of Troy, then retreated. When the people of Troy saw the Greek armies leaving, they opened the door and brought the gift horse into the city. That night, Greek soldiers, who were hidden inside the horse, overtook the people of Troy. Troy was conquered! Hence the term, “Never look a gift horse in the mouth.” That horse wasn’t what it seemed. What APPEARED to be a gift, was actually a trap. Likewise, Benny Hinn’s doctrines are a trap. He is preaching the Gospel of Jesus Christ, while simultaneously practicing and praising Catholicism (as you will see). The net result is apostasy. Benny Hinn Says Pope John Paul II Pointed Millions to Jesus! Benny Hinn Professes to be Catholic! It is disturbing to see Hinn put these two extrabiblical shrines in the same category as a biblical event. It must also be noted that in the incident in John 5, the man was healed by Jesus (John 5:12-13) and Bethesda is never mentioned again after this chapter. (It is a dry archaeological ruin today.) Further, no one is ever pointed back to it for help or healing. In Acts 3 the man is not pointed to the pool (which was nearby) but to Christ (Acts 3:6). Whatever temporary mercy God had shown at Bethesda ended with the person of Christ. But the point must be made that there is a universe of distance between what Lourdes and Fatima are promoting and the Jewish pool of John 5. At the Pool of Bethesda, no one was being encouraged to hold to teachings contrary to God’s Word. Benny Hinn is a false prophet who is EXPLOITING the Gospel to promote ecumenicalism, i.e., unity between Catholics and Christians. There is NO unity between a truly born again believer and the Great Whore of Roman Catholicism (2nd Corinthians 6:14-17). Hinn is effectively confusing the multitudes because so many people are woefully ignorant of the Word of God. I plead with you as a loving friend, and as a faithful Christian, to run away from Benny Hinn as fast as you can. 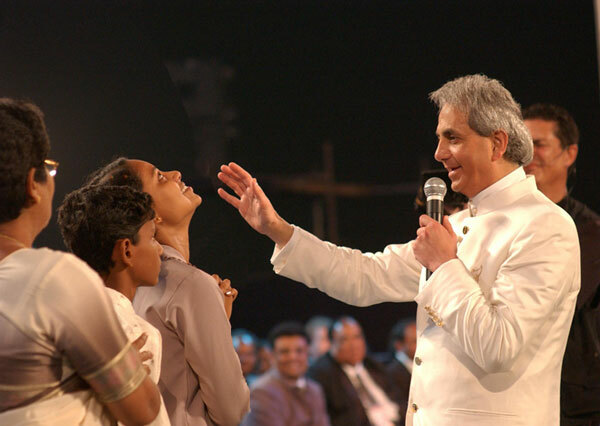 Benny Hinn – False Prophet! A couple of weeks ago I invested an hour and a half in watching Lakeland: The Movie, a documentary about Todd Bentley and the Lakeland “Revival.” You may remember that in April of 2008, a preacher and revivalist named Todd Bentley was invited to Ignited Church in Lakeland, Florida. The plan was to have Bentley there for five days of revival services. In the end he stayed for four months. What was meant to be a small, local event soon saw hundreds of thousands of people from 65 countries travel to Florida. Millions more participated through the Internet. Night after night Bentley would hold wild services full of singing, preaching, speaking in tongues, prayer for healing and miracles and, of course, the inevitable collection of money. The revival was marked by what were said to be great manifestations of the work of the Holy Spirit—speaking in tongues, ecstatic prophecies, miraculous healings and even the claim that somewhere around thirty people had been raised from the dead. Just about every major media outlet covered it at one time or another. Most of them went looking for evidence that miracles had actually happened; not surprisingly, not a single miracle was ever verified. By August the revival was beginning to slow down a little bit and Bentley decided to leave Lakeland and to take the revival on the road. Teaching that the Holy Spirit could be passed from him to others by the laying on of hands, he would tour the country and take this outpouring of the Spirit with him. But no sooner did he leave Lakeland than the media exploded with reports that Bentley and his wife would be separating. Apparently he had been carrying on an inappropriate relationship with one of the women connected to his ministry. He and his wife soon divorced and shortly afterward he had married this other woman. The revivals and his ministry came to a screeching halt, at least for a time. This documentary made me both angry and sad. I was outraged to see Bentley’s complete disregard for Scripture, his disregard for what the Bible tells us about the miraculous gifts, about maintaining good order in services, about so much else. What made me sad were the many looks at the people who had followed Bentley. There were many people, well-intentioned, I am sure, who gave up everything they had to follow him. They sold their houses, they walked away from their normal lives, and drove down to Florida where for a time many of them even lived together in a tent city. They looked to Bentley as their leader, the one who would be ushering in an age of revival, of constant miracles and supernatural deeds. They were enraptured by him, entranced by him, as they lived in a charismatic glow of constant prayer, prophecy, speaking in tongues and unusual manifestations of the Holy Spirit. via A Lesson From the Lakeland Revival | Overflow.